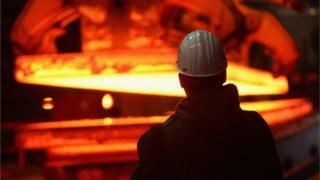 Steel firms in the UK could start to receive compensation for high energy costs within weeks. The government has confirmed that the steel industry will be refunded the cost of green levies on energy bills as soon as the EU grants state-aid clearance. The package could be worth about £50m a year for the struggling sector. But the government has come under fire for failing to have a steel industry strategy. Thousands of job losses have been announced in the sector in recent weeks, with the collapse of SSI in Redcar, Cleveland, and cutbacks at Tata Steel in North Lincolnshire and in Lanarkshire. The industry blames what it says are unfair Chinese imports, as well as the higher energy costs it faces compared with rivals elsewhere in Europe. The government wants to compensate intensive-energy industries, including steelmakers, for the green levies for renewable energy which add to the cost of our bills. Speaking during Prime Minister's Questions in the Commons, David Cameron said that the industry would have those costs refunded once the plan was approved at an EU level. "We will refund the energy-intensive industries with the full amount of the policy costs they face as soon as we get the state aid judgment from Brussels," he said. The compensation package was expected to be introduced from April 2016. Industry body Steel UK said that starting it earlier would give give the sector breathing space in the current crisis. "The steel sector had asked for a full commitment to help offset the cost of high energy costs and it now appears this will be given over the lifetime of the Parliament," said Gareth Stace, director of UK Steel. "This will give much needed confidence to the sector in terms of future investment." "It is now essential that we seek state aid as soon as possible, so that payments can begin immediately as promised," he added. But the government has been criticised for failing to have a strategy for the industry. Angela Eagle, the shadow business secretary, accused the government of sacrificing the UK's steel industry on the "altar of laissez-faire economics". Speaking during an opposition day debate on the steel crisis, Ms Eagle accused the Government of lacking an industrial strategy. "The problem that we are dealing with here is actually that this government don't have a strategy and they are living hand to mouth, trying to deal with a crisis that they should have seen coming," she said. Ms Eagle also called for the government to do more to prevent unfair trade. "China is currently responsible for a tsunami of cheap steel which is being dumped on European markets," she said. "The UK should be at the forefront of demanding rapid and effective action to stop it." Cheap Chinese imports were high on the agenda of the Business Secretary, Sajid Javid, during a visit to Brussels on Wednesday. The Luxembourg presidency of the EU has now granted his request for an emergency meeting of the European Council to discuss what can be done on the steel crisis. "I have been lobbying member states and met European commissioners to drive up the importance of this issue," said Mr Javid. "I have called for an urgent EU Council meeting on steel, and I am pleased the Luxembourg presidency has agreed that this will take place within the next 10 working days. I am determined this council leads to swift action, not just a talking shop." Mr Javid said that he had spoken about the issue to his counterparts in France, Italy and Spain. "When it comes to unfair trading practices, just as the US has taken action, we need to show that the EU can also take that type of action, but it can do it quickly," he said. Could the government save UK steel?